Not all marketing challenges for companies who want to promote their businesses are best met by tweaking their Web presence. Some of the most effective solutions to the marketing challenges organizations face in building awareness of their goods and services are real-time, real-world promotional items created by brick and mortar companies. Giving away promotional apparel builds brand awareness among potential customers in a subtle, but most effective way. Even companies who specialize in Internet marketing have used promotional apparel with great success. Take, for example, Sujan Patel, the founder of Single Grain, a San Francisco-based digital marketing agency. In his article, “How Giving Away T-Shirts Made Me Over $500K in Revenue,” Patel shares his story about how he used promotional apparel to catapult his startup company into one of the most successful marketing firms in the Bay Area. Patel, a marketing genius on the digital front, found an ideal way to promote his online business through a real-world solution. Yet he stumbled onto this marketing idea quite by accident, according to his story. His first order, he recalls, was somewhere in the vicinity of 25 to 30 shirts—many more shirts than his closet could hold. He decided to give the extra shirts away, so he used his personal Facebook page to notify his friends to see if there were any takers among them. To his surprise, his supply of shirts ran out in a matter of hours. Patel’s marketing genius kicked into high gear as he sensed the momentum building. When the demand outstripped the supply, he created an email list from the names of his friends who were too late for the first giveaway. He ordered a new supply of shirts, sent them to his grateful friends along with a personalized note in every package. Thanking those friends who chose to wear the t-shirts to market a business in which they had no stake was essential to Patel’s newly-hatched marketing plan. Gratitude, it would seem, is contagious—even in promotional efforts. Not only did he gain a treasure trove of contact information of people who wanted these shirts, but he created good will with every personalized note. With this one move, Patel had a list of people who loved to wear promotional apparel and had positive vibes about Patel and Single Grain. The next time he created t-shirts to promote his company, he would have a group of people at the ready to spread awareness about the Single Grain brand throughout the Bay Area. And so he ordered again—what he calls “Versio[n] 2.0. The second t-shirt created such a buzz about his Single Grain brand that Patel decided to launch the third incarnation of his t-shirt. This time, it was an intentional promotional effort, in a rainbow of colors and in much larger numbers. His goal: to give “a few shirts” to everyone who expressed interest. Not only did he provide t-shirts to his friends and colleagues, but he also donated some of the shirts to a charity. His goal was just to develop brand awareness with his shirts with an innovative logo, and, of course, the name of the company. At this point, there were over 500 people in the Bay Area who regularly wore the shirts in public. He and his co-workers began to use the shirts as “uniforms.” Because the area in which Single Grain was located was filled with fellow startups, the innovative logo design and company name attracted plenty of attention, which brought instant awareness of the Single Grain brand. Going forward, Patel tasks his design team with creating a new logo for a fresh look at least once a year—sometimes more often. With every design came more interest from his growing email list of Single Grain t-shirt fans. Like promotional wear from big companies such as soft drink manufacturers and sports teams, his shirts were developing a fan base of their own. Without a word, the apparel built awareness of Patel’s company throughout the area. Not only did it create more buzz in the community from fans wearing the t-shirts, but his and his colleagues’ own use of shirts bearing the company’s logo also gave Patel and his employees more opportunities to “give [their] 30-second elevator pitch and hand out business cards…” These conversations provided even more opportunities for Patel to raise awareness of his brand. As for Patel himself, he wasted no opportunities to strike up conversations with potential clients. Since he was always clad in his company t-shirt—even when working out and while doing his daily personal tasks—the entrepreneur had plenty of chances to grab new business. Plenty of it, it turns out. Those conversations about town led Patel to dig up $200,000 in new client work, which in turn, built up a network of satisfied customers who referred Patel to big-name corporations. Overall, the t-shirts raked in $500,000 in new business. In Patel’s case, the growth in brand recognition produced from this promotional wear also attracted the attention of huge companies such as Cisco, Wells Fargo, HP, Apple, and more. It snowballed from there. What is even more amazing is that Single Grain operates with only a tiny advertising budget—most of it spent on t-shirts. Those shirts took Patel’s company from being a complete unknown to becoming a familiar face in the San Francisco area. They built real awareness of a new, relatively-unknown brand. Single Grain now attracts a lion’s share of the Bay Area’s digital marketing business through word-of-mouth and from referrals. That kind of trust came about because people developed a comfort level with the company through its having become a familiar sight throughout the city and its environs. They maintained that level of trust by adding top-quality service on top of the brand recognition initiated by the t-shirts. Patel gives businesses who wish to use his formula to catapult their company to success some excellent advice. First of all, he advises, new businesses need to keep quality foremost when designing promotional apparel. After all, the apparel represents one’s company. If a company’s promotional apparel looks tacky, its reputation will take a nosedive. That’s not the kind of brand awareness a startup company needs at its start. Patel chose a top t-shirt manufacturer, American Apparel, to make Single Grain’s shirts. Including the tastefully-designed logo, the shirts each cost Patel anywhere from 10 to 15 dollars. Although his budget was tight, he realized that people wouldn’t wear shirts that were uncomfortable, which bore a cheap-looking logo, or that had overtly promotional text. Because he began by creating a shirt that he himself wanted to wear on an everyday basis, Patel created a shirt that his friends and colleagues wanted to wear as well. Not only were the shirts comfortable, but they were also well-designed. The shirts sported a tasteful logo on the front, a well-chosen slogan on back. That’s all. Patel also advises business owners who want to use promotional wear to create brand awareness to wear the garments wherever they go. Creating opportunities for striking up conversations with potential clients is a key ingredient in the success of such a program. Companies must bear in mind that this tactic will bear fruit in the long run if they are consistent in wearing the apparel. “People,” he shares, “start to get curious.” This inherent curiosity creates a drive in people to ask questions. Even if the person him or herself does not become a client, a business does create brand awareness among the general public. That awareness, in turn, leads to the sort of trust that gives a company the edge in word-of-mouth advertising—even future recommendations. Patel also advises companies who market their business using promotional apparel to be sure to thank those people who wear it. Recognizing these people’s contribution to a company’s success creates even more positive feelings about the brand. The people, in turn, feel invested in the company’s success and wear the apparel more often. Patel, it would seem has found an inexpensive way to rise to the challenge of promoting a business. Single Grain and its innovative founder have attracted much attention in the Internet marketing world for using brick and mortar marketing tactics to draw attention to their marketing prowess on the Web. Other businesses, both brick and mortar and online, have also experienced success marketing their services by using t-shirts and other promotional apparel to build brand awareness in customers and potential customers. Matt Hunckler of Verge, a company who helps entrepreneurs grow their businesses by forging connections with resources and investment capital, says this about promotional apparel: “Great t-shirts is the only marketing expense we’ve ever invested dollars into.” For Hunckler, marketing his business is a fun, yet simple affair. Perception, it would seem, is reality—at least in the world of marketing. The bandwagon approach is alive and well. If a company has a standout logo imprinted on quality apparel, people will notice. They will, of course, want a piece of the action. They, too, will want to wear such attention-grabbing apparel. And so a mass movement is born. A movement which any company would want to be at the center of. 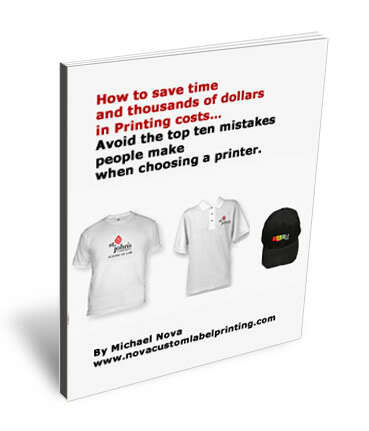 In all of these cases, whether the companies provided online or brick and mortar services, each of them used a real-world solution—t-shirt marketing—to overcome marketing challenges to become successful in their niches. Other businesses, too, can use branded apparel to market their products and services with equal success.